When we started the planning for MonoDevelop 2.2, the major goal of that release was to get feature parity on Linux, MacOS and Windows. We want to grow the community of developers that contribute to MonoDevelop and we wanted to attract add-in developers that wanted to bring their IDE extensions to all three platforms. MonoDevelop has recently been getting some nice community contributed plugins like Flash/Flex development support, Vala language support, Mono debugger for OSX (thanks to the nice folks at Unity for this! ), VI editing mode and of course our own Silverlight and ASP.NET MVC add-ins. My theory is that supporting MonoDevelop on all the three major operating systems will have a multiplication effect in terms of contributions to MonoDevelop: it will help both users and will enable developers that extend MonoDevelop with add-ins to reach more users. Developing an add-in for MonoDevelop now brings your enhancements to a much larger community. Although the IDE is built using Gtk#, but we are aware that developers want to get things integrated with their operating system as much as possible. This is why we have invested in properly integrating MonoDevelop with the Mac and Windows. The Look of MonoDevelop still has a heavy feel of the Linux Gtk+, but we are bluring the lines by making the theme and style match the operating system. Development in Gtk native themes will also continue to improve things. More work will come, because we want MonoDevelop to feel native on each platform. 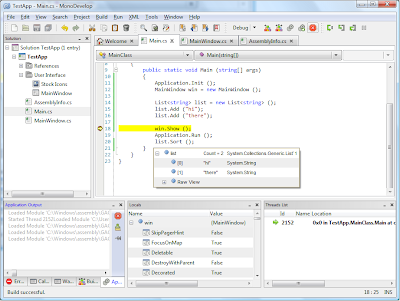 On Windows for example, MonoDevelop runs on top of the .NET Framework and uses the .NET managed debugger instead of using Mono's runtime and Mono's debugger, so there is no dependency on Mono to be installed on the system.